Want to be a “thought leader?” Remember it takes a lot of smarts to say things simply – and a different kind of “smart” than the brilliance of your in-house engineer, lawyer, architect, stylist​, etc. 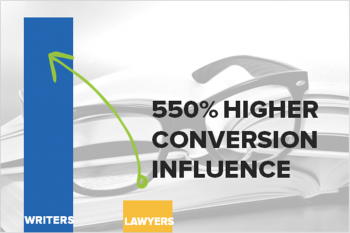 One client in the legal industry was skeptical of Brafton writers’ abilities to deliver content ​with the nuances that would leave an impression on potential clients. To ease their concerns, we created a hybrid blog, with some posts from our professional content writers and some from the firm’s lawyers.​ ​ The client’s main goals included thought leadership as an avenue to new business. It’s a common goal. Content marketing is rightly regarded as one of the best avenues to strut a brand’s intellectual agency, and 70 percent of people​ prefer to learn about companies via articles over ads. The team ​analyzed prospects’ web activity for evidence on which approach worked best, and the final ruling is that marketers should trust those with an editorial skill set to build a brand’s intellectual agency. The pieces that ran in tandem had decidedly different slants. The lawyers’ blogs were impressive, analyzing and criticizing recent court decisions in locales close to where prospective clients lived and worked. The problem: Fellow lawyers may be the only ones able to follow legalese and understand competency of the posts. The writers’ blogs took a different lens, carefully explaining how recent health hazards, business developments and similar community events might impact people’s lives toward a need for legal aid. It was quickly clear the writers’ blogs were garnering slightly higher traffic volumes. Crafting content around topics community members had questions about was step one in building an identity as a resource for consumers. It feels obvious to say consumers have a preference for content that answers their questions – still, it’s a simple truth. This idea is validated not only by the particular traffic patterns of the law blog, but also by updates from Google. Google, which makes its money arguably by serving the best results to searchers, is investing in a “semantic” algorithm that tries treat queries like person-to-person questions. Read more here. ​Traffic is the first indicator of influ​e​nce, but a real thought leader wins business on merit. So which pieces proved most valuable to the law firm’s bottom line? Using Google Analytics to trace reverse goal pathways for people who requested “free lawyer reviews​,​” the writers’ pieces took a strong lead. 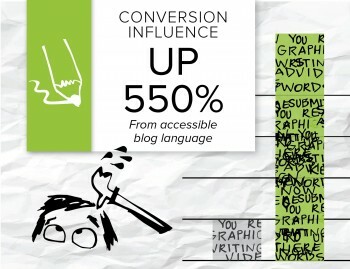 In a single month, the writers’ blogs had a 550 percent higher conversion influence than the jargon-heavy pieces. While several converting visitors had read both sections of the blog, there were far and away more new web leads who read (only) the writers’ posts on their path to form completion. Katherine Griwert is Brafton's Marketing Director. She's practiced content marketing, SEO and social marketing for over five years, and her enthusiasm for new media has even deeper roots. Katherine holds a degree in American Studies from Boston College, and her writing is featured in a number of web publications.